Spring is finally on its way and we couldn’t be happier! We’re excitedly adding stunning bright yellows and punchy florals to the store whilst keeping those cosy cover ups for the cooler days. We’ve also noticed that our pre-1940s pieces are flying off the shelves quicker than we can photograph them. Hannah is busily out buying at least every other week, so do pop in to snap up those precious pieces. 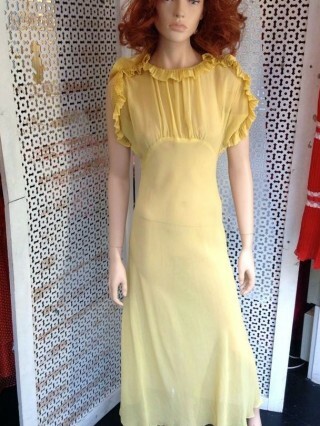 This stunning 1930s sunshine yellow gown is perfect for the warmer days ahead. The piece is cut on the bias and features divine ruffle details.